As knobs and buttons inside the car are gradually being replaced with touch screens, the number of displays in cars is increasing. 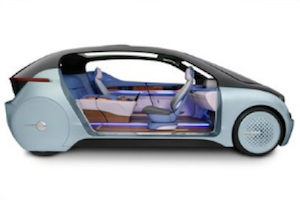 However, adding more and larger displays to the automotive human-machine interface (HMI) is presenting challenges for design engineers who need to satisfy both automotive requirements and customer expectations for aesthetically pleasing interiors. 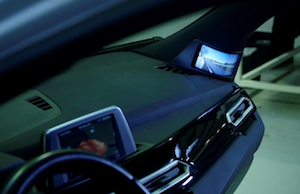 FlexEnable’s team has been working with automotive Tier 1 companies and OEMs to provide display solutions for addressing exactly those challenges. Our plastic Organic LCDs (OLCDs) can be conformed and shaped, and have been already used in demo cars by automotive partners including Yanfeng Automotive Interiors and Novares. A recent investment in FlexEnable by Novares will help accelerate the adoption of OLCD in cars. Novares Nova Car 1 featuring a curved OLCD as a rear view mirror (left). Yanfeng Automotive Interiors concept car XiM17 featuring an OLCD as a ‘transparent’ A-pillar to eliminate blind spots (right). Automotive customers often ask us about the key benefits of OLCD over other technologies. Here we explain why OLCD is the perfect fit for automotive HMIs. Organic LCDs are based on FlexEnable’s proprietary organic thin-film-transistor (OTFT) technology. The performance of OTFTs made with FlexEnable’s production process now exceeds that of traditional amorphous silicon (a-Si) TFTs. Therefore, displays made with OTFTs on plastic can match or exceed the optical performance of rigid active-matrix LCD (AMLCD) displays made on glass whilst also being thin, light, robust, conformable and shapeable. A previous version of FlexEnable’s OTFT process for electrophoretic displays (EPDs) has been in commercial production at Plastic Logic Germany for seven years. These displays have been proven to be extremely reliable in the field. OLCD re-uses many standard LCD processes and materials that are already proven and qualified for automotive. For example, we use TAC film as the substrate which is already used for polarisers in automotive LCDs. As OLCD uses existing LCD lines with minimum additional capital investment, the cost point is very significantly lower than plastic OLED. The OTFTs are very stable with temperature and humidity and require very modest encapsulation compared with OLED. Additionally, high brightness can be achieved with a bright backlight without compromising display lifetime (OLED lifetime declines rapidly with high brightness). FlexEnable’s process is the only industrially proven approach to producing active-matrix backplanes at low temperature which provides many production yield and cost benefits. Competitive approaches typically require the use of polyimide (PI) as a high temperature substrate, but this requires a high stress and low yielding process to release the PI from the carrier glass. PI also has much less ideal optical characteristics than TAC. FlexEnable has developed a version of our OTFT process that can be used to adapt existing LCD production lines to make plastic OLCDs. This has been licensed by Truly Semiconductors, and we are together targeting consumer, industrial and automotive applications. We have demonstrated that an OLCD assembly including backlight, glass cover lens and touchscreen components from Truly can be curved down to a bend radius of 10mm. The displays can be easily cut to non-square shapes during the production process and holes in the display are also possible.